I have spent a week realising why I prefer armour nowadays. I took a couple of evenings to put the Firefly together. Even the LCM only took about 4 days. 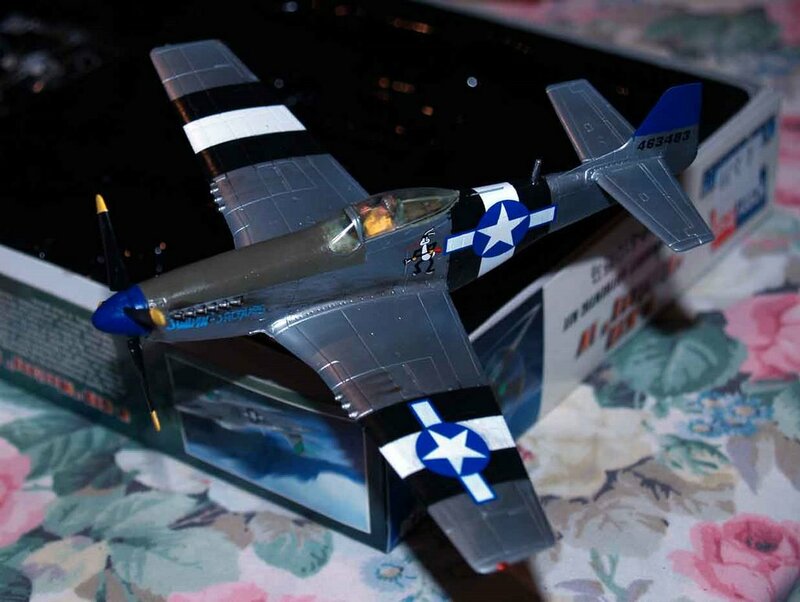 However, this Hobby Boss P-51 has taken about 8 days one way and another. Its the too-ing and fro-ing that does it. Make a bit - paint a bit - make a bit and so on. I did try Aclad for the first time and was pleasantly surprised with how easy that was. I needed a pilot so cut up an Italeri Bitish Infantry figure - even made himwave as he flies over. The day after I did this, we took delivery in the shop of a set of Heller (old Airfix) RAF personnel! Never mind. Here is a snap of the completed item. Now a cry for help. I need a piece of transparent sprue that is at least 6" long. I don't mind if it has joins etc., just so long as I can trim it to that length. If anyone has one I would be grateful if I could get hold of it by next Saturday at the latest. 2nd Cry for help - Aaron - my new supply of Polymorph hasn't arived. If you have more then could you lend me some? I have now started the Sherman on the beach, hoping that I can get on with the beach itselfby Wednesday at the latest - we shall see!